A 22-year-old woman presented with complaints of mild vaginal bleeding, excessive nausea and vomiting for the previous 2 weeks. She was married for 9 years and was Para 1+2 with history of one intrauterine death. She had no history of induction of ovulation or use of oral contraceptives. 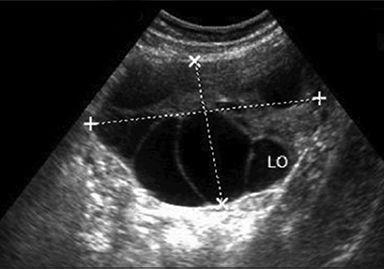 Transvaginal ultrasound examination revealed uterine enlargement and the endometrial cavity was partially filled with cystic areas of increased echogenicity and typically showed snowstorm appearance. 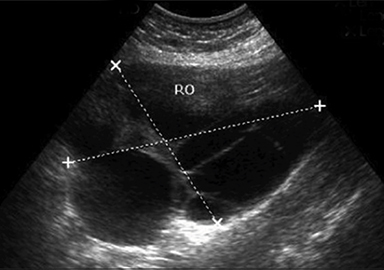 A fetus was seen corresponding to 10 weeks of gestation, but cardiac activity was not present. The sonographic findings were representing partial molar pregnancy. Both ovaries were significantly enlarged; the right one measured 14 × 10.2cm and the left 10.7 × 6.6cm. Both ovaries were showing multiple enlarged cysts of varying sizes bilaterally. Some of the cysts showed fluid-fluid levels. These were suggestive of theca lutein cysts of pregnancy in both enlarged ovaries in association with the partial hydatidiform mole. The patient was referred to the obstetrics and gynecology department for further management, where dilatation and curettage (D&C) was performed along with serial beta HCG levels, which were markedly raised. The patient was then managed accordingly. Gestational trophoblastic neoplasia (GTN) represents a spectrum of disorders characterized by abnormal proliferation of pregnancy-related trophoblasts with progressive malignant potential. GTN includes molar pregnancy, invasive mole, choriocarcinoma and placental site trophoblastic neoplasia with varying degrees of malignant potential. Molar pregnancy complicates about 0.1% of pregnancies. Hyperreactio luteinalis is a rare disease characterized by marked cvstic enlargement of the ovary due to multiple benign theca lutein cysts. It has been suggested that these cysts arise from an abnormal response of atretic follicles in the ovaries to circulating Beta-hCG, which may or may not be high.5 It occurs usually in gestational trophoblastic disease, multiple pregnancies, and rarely in normal pregnancy. In this case, hyperreactio luteinalis was present with partial hydatidiform mole, which is not a common association as shown in Figure 1. Clinical manifestations of this condition would include maternal abdominal pain, excessive abdominal distension, abnormal liver functions, respiratory difficulties, and hirsuitism. In this case, patient presented with pain and hyperemesis. Patients with this condition may be asymptomatic also. These lesions may be found incidentally during routine obstetric imaging and Caesarean delivery. HL is a benign condition. The appropriate management is conservative, but surgical management is definitely indicated to remove infarcted tissues following torsion, to control hemorrhage or decrease androgen production in virilised patients.10 Patient complained of mild to moderate abdominal pain in this case, which was not progressive; therefore, there was no clinical suspicion of torsion or hemorrhage complicating the cyst. Hyperreactio luteinalis is a benign condition causing enlargement of the ovaries. Recognition of HL is important, since misinterpretation has resulted in unnecessary surgery, often with sterilization. Follow-up with serial Beta-hCG is crucial in managing these cases. They can be complicated by rupture, torsion or hemorrhage, so careful monitoring is required. 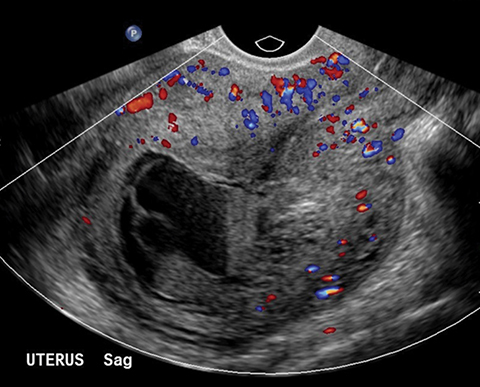 This case is unique as there were only few reported cases of bilateral corpus luteal cysts associated with partial hydatiform molar pregnancy in the literature. Kobayashi E, Setsu N. Osteosclerosis induced by denosumab. Lancet. 2014 Oct;pii:S0140-6736(14). Schnorr JA, Jr, Miller H, Davis JR, Hatch K, Seeds J. Hyperreactio luteinalis associated with pregnancy: a case report and review of the literature.Am J Perinatol.1996;13:95-97. Bidus MA, Reis A, Magann EF, Matin JN. Markedly elevated b-hCG levels in a normal singleton gestation with hyperreactio luteinalis. Obstet and Gynecol. 2002;99:958-961. Upadhaya G, Goswani A, Babu S. Bilateral theca lutein cysts: A rare cause of acute abdomen in pregnancy. Emerg Med Australia. 2004;16(56):476-477. Gatongi DK, Madhvi G, Tydeman G, Hasan A. Case of hyperreactio luteinalis presenting with eclampsia. Obstet and Gynecol. 2006;26(5):465-467. Chiang G, Levine D. Imaging of adnexal masses in Pregnancy. J Ultrasound Med. 2004;23(6):805-819. Foulk Ra, Martin MC, Jerkins GL, Laros RK. Hyperreactioluteinalis differentiated from severe ovarian hyperstimulation syndrome in a spontaneously conceived pregnancy.Am J Obstet Gynecol.1997;176:1300-1302. Simsek Y, Celen S, Ustun Y, Danisman N, Bayramoglu H. Severe preeclampsia and fetal virilization in a spontaneous singleton pregnancy complicated by hyperreactioluteinalis.Eur Rev Med Pharmacol Sci.2012;16:118-121. Van Holsbeke C, Amant F, Veldman J, De Boodt A, Moerman P, Timmerman D. Hyperreactio luteinalis in a spontaneously conceived singleton pregnancy. Ultrasound Obstet Gynecol. 2009;33:371-373. Abe T, Ono S, Igarashi M, Akira S, Watanabe A, Takeshita T. Conservative management of hyperreactio luteinalis: A case report.J Nippon Med Sch. 2011;78:241-245. Lee KB, Kim GJ, Hwang BC, Cho HY. Hyperreactio luteinalis associated with a normal singleton pregnancy. Korean J Obstet and Gynecol. 2002;5(6):1092-1096. Imtiaz S. Hyperreactio luteinalis with partial molar pregnancy. Appl Radiol. 2017;46(1):45-47.